The aim of the Geomatics Regional Information Society Initiative (GRISI) project is to develop new geomatics services in such areas as the E-economy, E-identity, E-government and interregional co-operation. There is also the need to create �added geomatics value� to existing initiatives and to demonstrate geomatic solutions as a tool for promoting economic development. 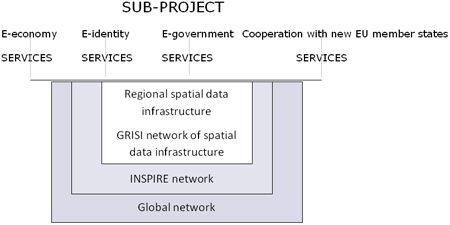 The organisers of the GRISI project have established four spatial data infrastructures in four partner regions, and they have also completed five thematic sub-projects which supplemented the established infrastructure with specific thematic services. A total of 25 local and regional organisations from four European regions (Midi-Pyr�n�es, Navarra, Abruzzo and Latvia) took part in the various activities of the Geomatics Regional Information Society Initiative (GRISI) project � training, establishment of geomatic platforms, and preparation of more than 120 new geographic databases and 27 new Internet sites, with the greatest attention devoted to the benefits of geomatic services. A total of 29 events were organised all around the world to disseminate information about the project. The hope is that the success of the GRISI project will encourage other European regions to use the advantages that are offered by geomatics. A sub-project, REGIS, was developed by the partner in Latvia, and the aim was to promote development of local government territories so that their attractiveness could become evident to all interested parties. The project also allows any organisation from any country in the world that is seeking international partners on the basis of the GRISI project to gain full information (socioeconomic data, as well as self-evaluation of issues from local government leaders) about specific local government territories. A geo-portal which has been established makes it possible to understand local government interests quickly and conveniently, which enables an evaluation of the potential of these local governments to become partners in various projects. Today anyone can find geographic information about all of Latvia�s local governments, as well as make use of the established infrastructure, other services, and spatial data for search and viewing. Registered users can also publish their own data. � Co-operation with new EU member states (REGIS, http://regis.grisi.org). The results of the GRISI project differ from those of many EU projects because of its added value in terms of geo-localisation, development and publication of various geographic databases. Four GRISI project partner regions have achieved their intended goals with the support of the Interreg IIIC Southern Zone programme project Ref. No. 3SO145R. During each of the sub-projects, information was collected, and new information was created, geo-referenced and published in the geo-portals of the various partners. The result of this project offers substantial support to local and regional organisations, with new geomatic services established in the various regions. The Daugavpils University represented Latvia in the sub-project which focused on E-work in pursuit of territorial economic development. Participants learned how to involve teleworkers. They established qualification and advertising offers for the territory, and they also drafted procedures and ensured the availability of the necessary tools. Today project participants have a clear vision as to the cartographic tools that can be used to advertise the territory and to promote new installations (cartography on the Internet, GIS, etc.). The Daugavpils University established a geographic database about local tourism objects. It also designed a technology which ensures the compatibility of the data with the GRISI spatial data infrastructure and the geo-portals of project partners. Discussions and an exchange of experiences among four partners helped to define local government needs and interests so as to supplement knowledge about those areas in which partners had not initially demonstrated very much interest. As is the case with other sub-projects, the GEOPOP technical sub-project integrates the principles of co-operation and the reuse of established data. The Bauska District Council was the GEOPOP project partner. It established a territorial planning database for the district, one that is compatible with the spatial data infrastructures of partners, as well as with the Internet map service that is widely available on the Internet. The aim of the REGIS sub-project was to establish a geo-portal and various services that are available on the Internet so as to encourage interregional co-operation, regional development, and the integration of regions in new member states into the European community. The geo-portal provides users with all-encompassing information about Latvia�s regions, and anyone in the EU can see and identify that which is interesting in terms of establishing regional partnerships. The spatial data infrastructure helps everyone to understand what geomatics mean in practical terms. Co-operation among universities (the R�ga Technical University, the ITI, and the IUT Paul Sabatier) led to the creation of new technologies and knowledge. The result is a set of GIS applications which are compatible and can be used in tandem. Participation in the GRISI project offered new and original experience for Latvia. The partners for the REGIS sub-project include the Latvian Technological Park, the Latvian Statistical Institute, the Riga Technical University, the IUT Paul Sabatier university in France, and the Abruzzo region in Italy. Latvia�s geo-portal (www.grisi.lv) supports interregional co-operation and promotes regional development and knowledge about the spatial data infrastructure so as to demonstrate the attractiveness of regional territories. The project experience is to be transferred to other Baltic States, thus supporting our region�s integration into the European Union. � INSPIRE encourages international co-operation in the management of geographic information. The GRISI project is unique in Latvia at this time. It offers a lot of knowledge about spatial data infrastructure to various organisations in Latvia, allowing all interested parties to test the opportunities and advantages that are afforded. The GRISI project also popularises ideas about the spatial data infrastructure at all levels of public governance. This can influence the development of the Latvian state�s spatial data infrastructure even this year, as well as later. At the international level, Latvia has gained a great deal from its participation in the GRISI project. It not only offers unique experience and knowledge from close co-operation with the governments of Spain, France and Italy, but it also makes it possible to demonstrate Latvia�s own best experience in the establishment of geo-portals to partnered regions. The GRISI project makes it possible to seek out and disseminate information in a convenient way so that it can be used again and again in the context of any infrastructure.